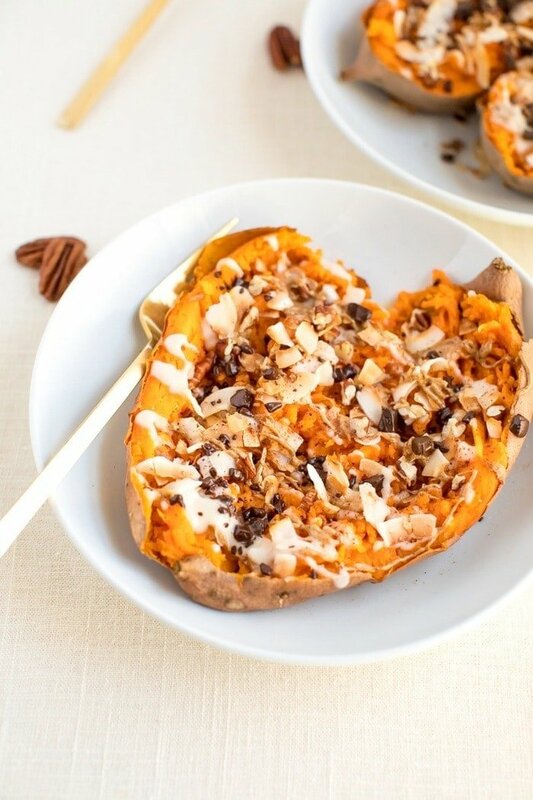 Turn nutrient-rich sweet potatoes into a satisfyingly sweet dessert! Just bake and stuff with your favorite toppings. 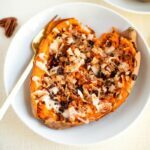 This particular dessert baked sweet potato is loaded with toasted coconut, coconut butter, cinnamon, almond butter, pecans and dark chocolate. 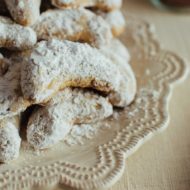 Vegan, gluten-free and paleo-friendly. Sweet potatoes are one of my absolute favorite vegetables and over the years I’ve found so many different ways to enjoy them — from sweet potato fries to sweet potato toast, sweet potato croutons and sweet potato brownies, there’s really nothing this veggie can’t do. On the nutrition front, they’re rich in complex carbohydrates, dietary fiber, beta-carotene, vitamin C, manganese and potassium. 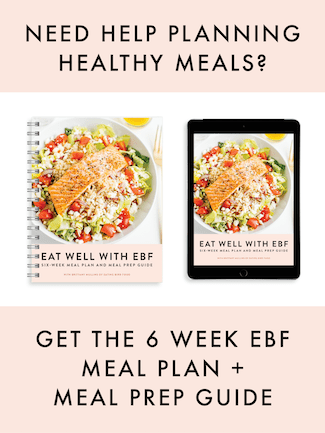 And when it comes to satisfying a sweet tooth craving in a healthy, whole-foods fashion, sweet potatoes are the perfect solution, especially when baked until the potato is oozing caramelly goodness. This is when you know the sweet potato is going to be extra sweet! 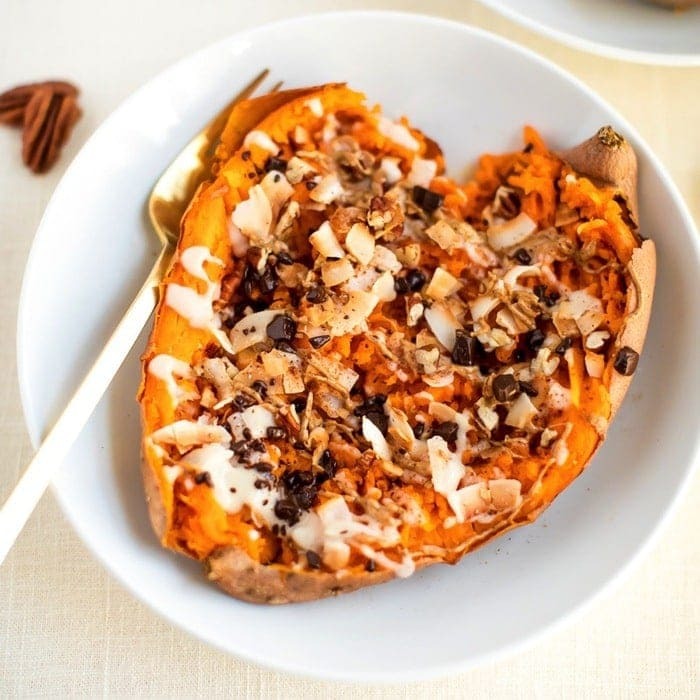 Baked sweet potatoes topped with a little coconut oil, butter or ghee are already reminiscent of dessert, but it’s totally possible to take things to another level with just a few additional toppings. 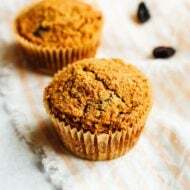 I’m giving you a ton of dessert sweet potato ideas below, but for the version I’m sharing today we’ve got a mix of cinnamon, coconut flakes, coconut butter and chopped pecans. I couldn’t help myself and decided to add a drizzle of almond butter AND chocolate as well! At first I wasn’t sure the potato needed chocolate, but it definitely adds a little something and makes it feel even more like dessert. That said, if you’re having this as part of your breakfast or just want to keep the sugar content a bit lower, you can skip the chocolate. If I were going to serve this for breakfast I’d likely eat it before or after my workout and pair one half of the sweet potato (and toppings) with a couple eggs, a protein shake or another good protein source. This would make for an ideal meal with complex carbs, protein and healthy fats! Preheat oven to 400° F. Pierce sweet potato several times with a fork. Place the sweet potato on a rimmed baking sheet lined with foil. Bake for about 45 minutes, or until sweet potato is completely tender and oozing a little bit. Make a slit in the top of the sweet potato. 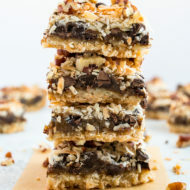 Mash down each side and add toppings: coconut butter, almond butter, coconut flakes, pecans, dark chocolate and cinnamon. Enjoy warm. Oh, thank you Brittany! Though I did find myself treating my sweet potato like a banana split, putting on the coconut, reaching for the pineapple- and going for the caramel sauce. I am pitiful, but gracious, at least it wasn’t a banana split!! I don’t have or ever use coconut butter. What can I use instead of it? That’s fantastic! My personal recommendation to make this recipe even more special would be to replace the toppings with nothing, and replace the sweet potato with a Mars bar. Delicious!